When I was a baby witch, just learning my craft, I got really into herbs. I had the classic Herb Book, which is likely still in my library somewhere! I bought herbs at magick shops and food co-ops. I had mason jars and containers full of herbs. I made my own incense. I made massage oils and candles. I made tea (technically tisanes) and potions. I’m not much of a cook, but give me a shelf full of herbs and a pot of water, and I’ll mix something that smells good, at least. At various times, I’ve had herb gardens. Herbs are at the heart of magick for me. In pretty much every culture, there has always been a healer, a witch, a wise one that knew the ways of plants and how to use them to ease suffering or to conjure dreams and visions. And this is another thing that somewhere along the way I lost touch with. I had an herb garden when C was a baby. When we lived in Washington, there was a huge herb farm nearby (which seems to have “retired” now). But as we moved around, I had to leave behind living plants, or give up space on my shelves for things that had a higher priority. I used up or got rid of my stash. Eventually, all I had were the basic cooking herbs. As our financial situation worsened, and my daughter grew, and my faith waned. . . I gave up my herbs. I gave up my magick. Last summer when I was going to one of the local farmer’s markets, there were big bunches of purple basil and mint. I brought them home and used some of the basil for a tomato sauce and mint to flavor my water, but I didn’t want to waste the huge bunch, so for the first time in a long, long time, I hung up my herbs to dry. Weeks later, I was looking for my regular, old, bought-for-cooking dried basil and couldn’t find it. Then I remembered, among my cluttered shelves, I had hanging this beautiful basil. 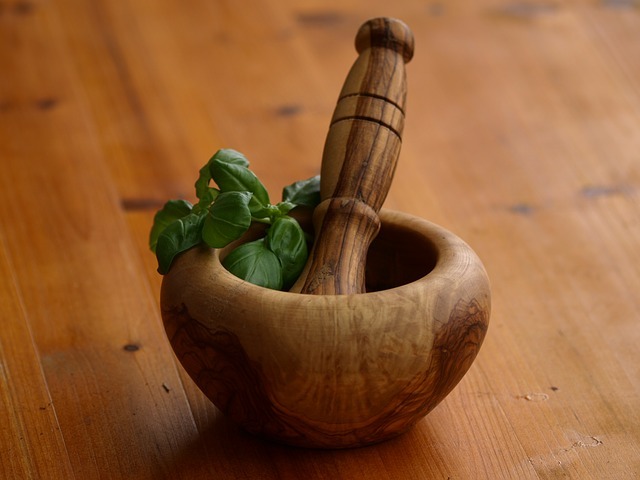 My mortar and pestle, if I still have them, are in storage, so I pulled the leaves off the stems into a bowl and rubbed the dried leaves between my hands to make them smaller. My hands smelled like fresh basil, and the taste of the herb was strong in my sauce. Basil is for flying, faithful love, and drawing money to you. I felt so good to be doing that simple thing. Refreshed. One of my Core Desired Feelings is “Restored”. As my daughter is pretty much grown up now, and I’m rediscovering who I am without the “C’s mom” added to my name, I know that I need to bring the herbs back into my life. I regret leaving them behind and not bringing my daughter up with the full appreciation of the art of herbal magick. I don’t know if I can realistically fill up my shelves again the way I did in my early 20s, but I want to start again. I wonder if the apartment complex will notice if I cut a few rosemary branches?